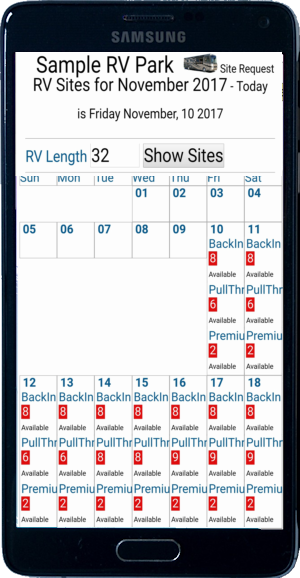 RVRequest.com is a mobile-friendly web site that allows your RV guests to request a site. Requests are quick and an email is sent to you and your guest. You review the request, contact the guest and book the site. Your guests can use their phone, tablet or computer for reservations. Register for our service and add your park. Add your sites by type: BackIn, PullThru, Premium, etc. Link your web site to RVRequest and that's it! Register Here for free. Is this system for all RV parks? No! We have been full time motorhome travelers since 2006 and visited over 400 parks (as of 02-2017). Our company, MattsonExpress.com caters to small and medium size RV parks. We enjoy providing economical web services to parks where we can work directly with the owner or manager. No. It can take too many guest questions to calculate a price	. Most full time RV guests avoid this and call or find another park. Click on our FAQs link for further explanation. Our system is simple to use and all data comes from your staff. Choose plans 1001/1051 if you are computer-proficient and will require little set up assistance. Plan 1001: 1 to 50 RV sites. $20 set up fee, covers the first month. Quarterly fees are $60/quarter. Plan 1051: 51+ RV Sites. $30 set up fee, covers the first month. Quarterly fees are $90/quarter. Plans 1001/1051: All set up support is free. Choose plans 2001/2051 if you will need us to give assistance throughout the set up. Plan 2001: 1 to 50 RV sites. $195 set up fee, covers the first quarter. Quarterly fees are $30/quarter. Plan 2051: 51+ RV Sites. $195 set up fee, covers the first quarter. Quarterly fees are $60/quarter. Plans 2001/2051: Refunds: $150 within 30 days, $75 within 60 days. All set up support is free. For any plan you may terminate at any time with no penalty. The sooner you get started, the more RV travelers will request your park.